When Zeus Decides that He Doesn’t Want to Leave the Car, He’s Sure to let Everyone Know It! According to Zeus’ humans, life can sometimes feel like a constant, up-hill battle with him. This gets especially bad, as you could clearly see, when Zeus decides that he doesn’t want to do something his humans are telling him to do. And trust us, it’s not just his humans that know he’s unhappy, the whole neighborhood gets to hear the news! Most dogs know that when they don’t get their way, it’s just part of life and yield to their owners. They know we love them, but when it’s time to leave the park or they’ve had enough scraps from our tasty grilled chicken breast dinner, they stop begging and head to their bed. But one husky doesn’t really understand the whole “I shouldn’t always get my way” thing. Zeus is incredibly stubborn and has taken the internet by storm with his wild tantrums. From refusing to leave the bathtub (even without water), to saying “Raooooo,” i.e. “No,” to his morning walks, he’s delighting people all over with his hilarious outbursts. Even though living with Zeus is a “constant battle of wills,” according to his owner Lindsay Fleishman, this time the recalcitrant pup finally gets on the move, but not without a little howling to delight us. 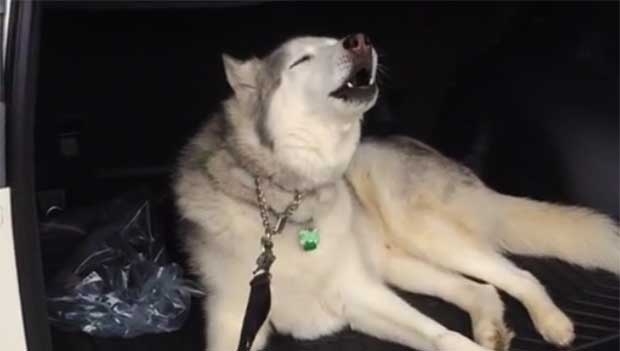 Responses to "Husky Refuses To Leave Car, Throws Epic Tantrum "